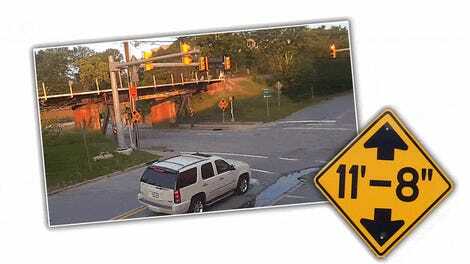 There’s one particular bridge in Durham, North Carolina that’s something of a celebrity around these parts. Despite the best intentions of local officials to warn drivers about it, people keep slamming into this 11-foot 8-inch high railroad truss, affectionately known as the Can Opener Bridge. The bridge claimed its latest victim earlier this month, as we can see on to 11foot8.com. The hits have been coming about once a month since April 2008. Oh sure, the crashes slowed down a bit last year when Durham installed a traffic light that would turn red when a truck taller than 11 feet 8 inches was sensed to be approaching, along with a big electrified sign flashing “OVER HEIGHT MUST TURN” at drivers, lest they lose their box tops. Bad news: It didn’t work. 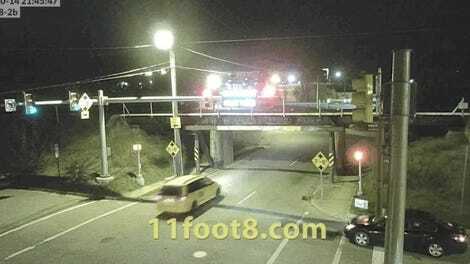 Six vehicles have crashed into the bridge this month alone. 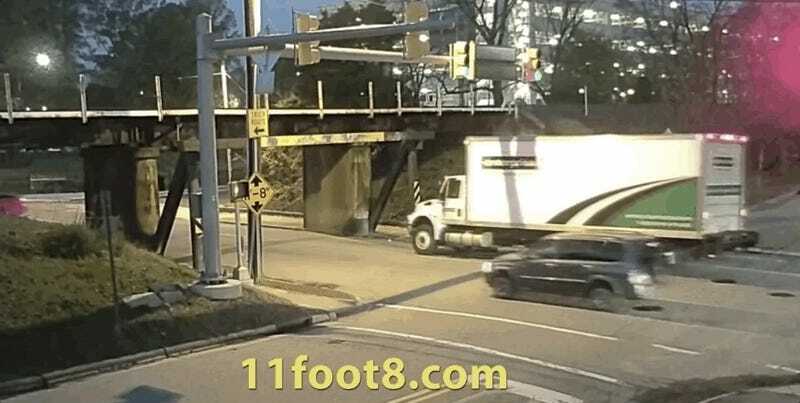 In this video from Nov. 19, the Enterprise moving van seemed home free after it turned left to avoid the bridge entirely. Smart! But for whatever reason, it came back and the driver decided to go for it. And things don’t end well, because they never do. The bridge, of course, is just fine, standing proud 137 strikes and counting since 2008. The Can Opener Bridge is mainly dining on moving trucks this month (though it did take out the AC unit of an RV), which makes me think either there are a lot of people new to the area that aren’t familiar with this hungry piece of infrastructure. Either way, pay attention to road signs, folks! They could save your life, or at least your deposit.